Philip was born in Kenya and spent his childhood years living in extremely remote areas, spending much of his time exploring the African bush. These early experiences gave him a great love of wild places and nature, which later developed into a desire to capture what he witnesses in the wild through creative photography, in a way that would not only reveal the wonders of nature, but also employ his artistic flair. What inspired you to get involved with remote photography work? While I was photographing in National Parks and Reserves in Kenya in 2008, I was becoming increasingly frustrated with being restricted to designated roads and attempting to capture wildlife from large distances. I wanted to be able to create a different perspective in my images as there were many other photographers that I saw, day in and day out, attempting to shoot the same scenes, side by side. I felt that I had to diversify and add a different dimension to my images. At that point, I was inspired by Anup Shah’s low level photography in unusual locations and aspired to create my own images with a similar unique twist. One day I finally took the plunge and brought a simple hand-drawn sketch to a local carpenter to make an 8ft plank of wood with a base fixed on one end where I strapped the camera. This was then hoisted out of my 4×4 vehicle and placed onto the ground whilst I held onto the plank from inside the car. This gave me great versatility but meant that the animals always had to come to me. In the coming years I developed boxes which I would place in appropriate places and fire with a remote shutter release from a distance. My initial setup was simple but worked like a charm. Although it needed more protection for the camera. These are my first attempts. Obviously getting close to your subject usually improves the image quality and gives better depth to the environment. But the greatest advantage that I see from this approach is that you are immediately propelled into the animal’s world. It’s amazing how quickly the characters of each animal are immediately exposed and this comes across in the images. The biggest disadvantage for this type of technique is that the situation doesn’t always allow for a camera to be placed out on the ground, maybe due to terrain issues such as rocks and long grass. My camera set-ups over the years have never had wheels, so lack of mobility has been a major drawback. It can also be intrusive on the animals if not used wisely. Anticipating what might happen in a scene in front of you is the skill that I have had to learn very quickly to get the best out of my camera trapping. With experience now on my side, it’s much easier to know what works and what doesn’t, which means preselecting every aspect technically has become more of a feeling based on the situation rather than following a step-by-step checklist. When you lose shots because of poor judgment on something such as exposure modes, focus, angle of view or depth of field, then it usually doesn’t happen again. One of the biggest challenges is not knowing whether the camera will get mauled. 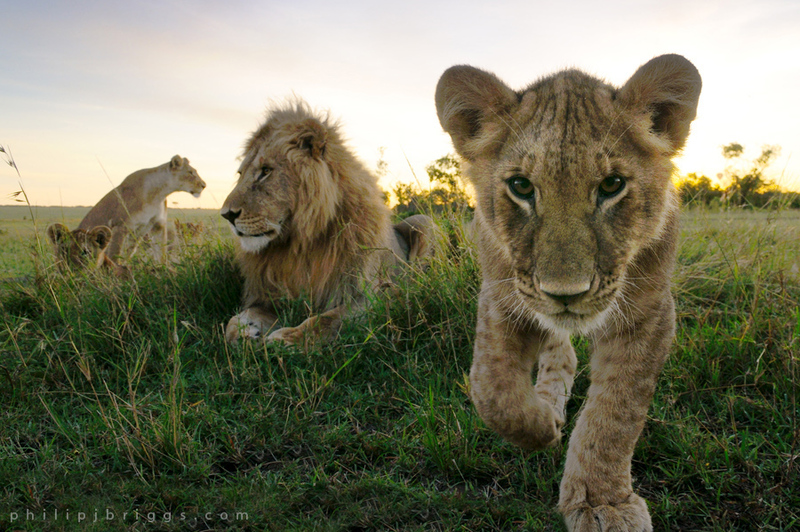 I often wonder if I’m completely crazy when I leave an expensive camera and lens out in the open with minimal protection in close proximity to lions. When a curious lion gracefully lifts the camera in its mouth and turns to run 50 metres before dropping it, there is a certain feeling in my gut that I can only associate with falling from a great height. But time and again, the resulting images are worth the damage inflicted. 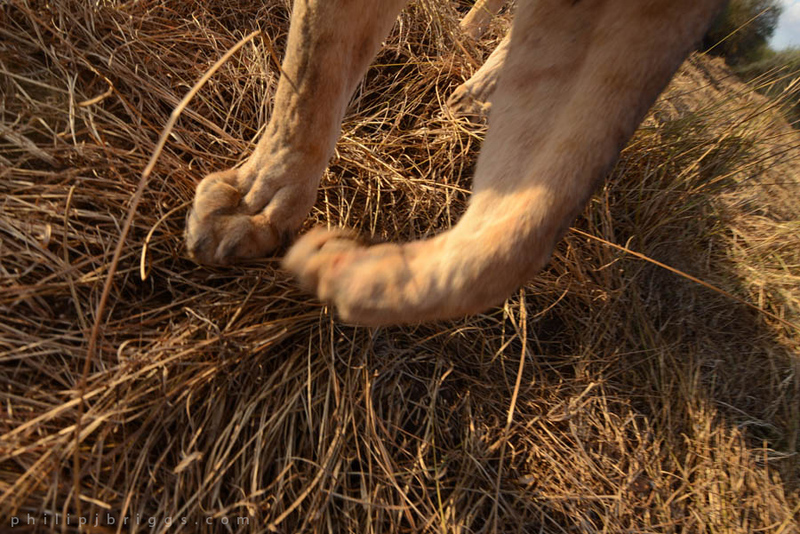 The smartest trick which I mastered was learning that lions need something to bite onto if they are going to lift something and quite frankly I’d prefer it wasn’t my lens. I developed a raised section on top of the protection box which usually does the trick in allowing the lion to bite the box without harming the camera. Below you can see that my lens – the only exposed element of my gear – is avoiding attention. In the second picture the lioness is walking with the complete box in her mouth! My set up is usually quite simple. My aim is always to keep the camera as low to the ground and have a very tight protecting box around it to keep the setup as low as possible. This is important so that when the sun (I only use natural light) casts a shadow in front of the lens, it is kept as short as possible and therefore doesn’t interrupt shooting as the sun gets lower. As you can see in the image below, if my setup was 1-2 inches taller it would cast a shadow further up the forearm of the cub in the middle. More recently I’ve been using a remote shutter release, whereas previous to that the camera was set to take a photo about every second once deployed. A remote shutter release saves pointless frames being shot but means that I can’t go far from the transmitter in case they lose contact. I like to be able to keep my setup simple and compact with minimum technology, but inevitably if I want more control over what’s going on, then I can see the need for more technology being introduced to my system in the future. My personal perspective is that photography is never complete. I have been set projects and achieved them but always feel that there is more potential out there to improve what I have. It has taken me many years with limited opportunities to develop my style and now I’m beginning to increase the depth to my images (like adding more mood to the scene by using heavy cloudscapes) and making use of better low light. One of the most important elements for me is gaining knowledge of each lion individual intimately by reading their behaviour over time. All of the images I’ve taken in the recent years are of lions that I’ve known by name, often since their birth, and this approach can give me an advantage. The images being produced from my current set up are very rewarding but all that tells me is that the future is bright. Images like this (see below) take patience to the next level for me: I often spend months on end waiting for the situation of finding lions on a fresh kill (and to know the lions will be comfortable with my presence near their kill), that it be accessible for vehicle and camera, good landscape, getting the season right for the heavier dramatic clouds/or the moon to be up, and the light to be as low as possible to bring the scene to life. Once I nail the image I’ve been envisioning I’m usually filled with such accomplishment that it spurs me on to keep being patient when other shoots come and go with nothing to show for them. There have been numerous sessions where the subjects, the lighting or the scene is rich and exciting and I can’t wait to get my camera back to see the images. Like a child opening a present I scramble to open the box and press the playback button to see what I’ve captured – only to be disappointed when I see the first images and I know that they are all terrible. Often the focus doesn’t catch the subject or the exposure blows out whites if the scene changes too dramatically during the session. On one occasion I was testing a different focus mode and it failed emphatically – with every image out of focus – mainly due to the focus hunting between the sky and a tree but never finding the subject. The silver lining through, was that one of the lions turned the camera to a different angle (the camera was flipped onto its side and flopped back down to a slightly different view) which resulted in much improved results! It’s a bit embarrassing to think that a lion got better results that day than I did, but alas, you live and learn. See below. 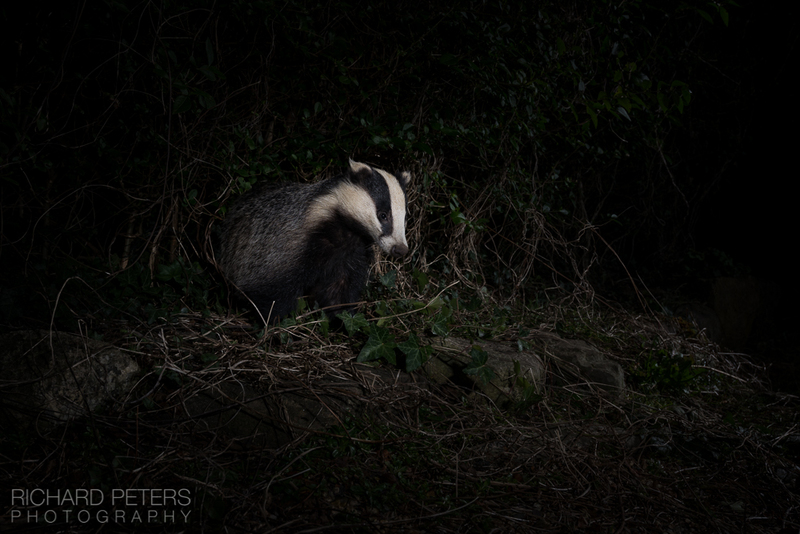 I never feel so much in control of what I’m doing with regards to photography than when I’m camera trapping. 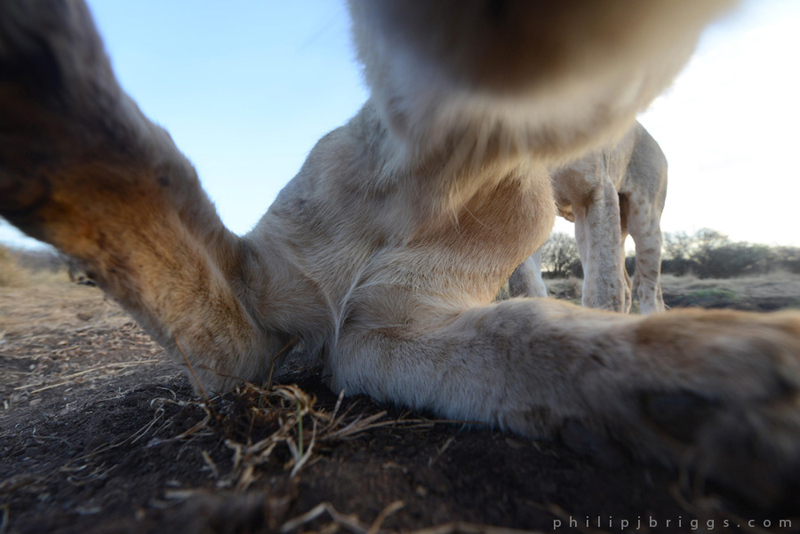 The only thing that is out of my control is what the animals do and that applies to every type of photography. The meticulous preparation and thinking through scenarios prior to deploying my camera is great practice for me and I apply it to my normal photography as well. If I make a mistake during my preparation then I may indeed lose shots, or if I see an amazing scene in front of me and don’t capture it like I wanted, then I can’t blame the camera. With the image below, I got everything right especially the focus and framing through the grass but I didn’t leave enough space to include the back end of the lion. Occasionally I get lucky with a setup but I am there pressing the shutter from a distance with a remote so it just feels like I deserve the resulting quality images because of all my preparation. 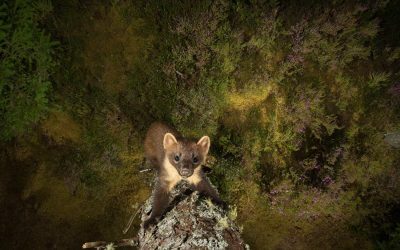 "I never feel so much in control of what I’m doing with regards to photography than when I’m camera trapping. The only thing that is out of my control is what the animals do and that applies to every type of photography." The advancements in technology are radical even since I started in 2008. The possibilities are endless and the images that we will be getting will only get better and better. When I started I dreamt of having some of the technological advancements which we currently have at our finger tips. I have many more aspirations for new styles of shooting and feel confident that within a few years something will be developed to allow me to make those aspirations possible. 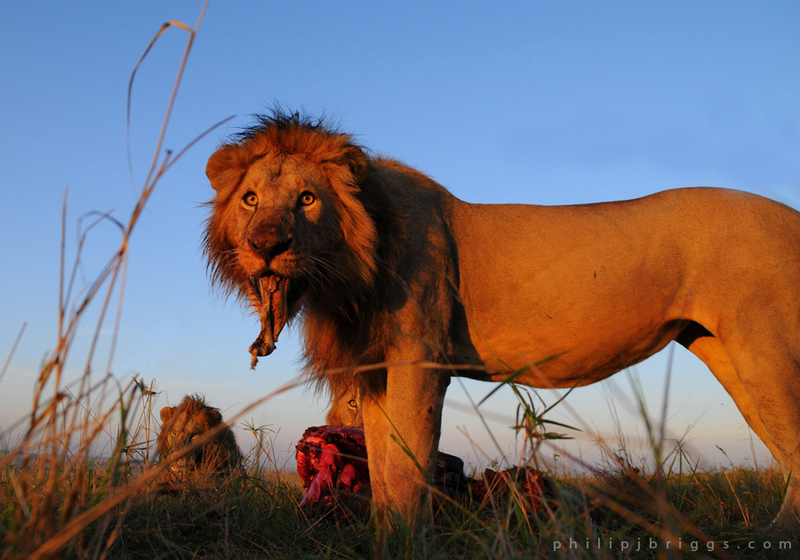 More of Philip’s work can be found on his website, where you can also learn more about his current projects, inlcuding Lion Guardians, which works in Kenya and Tanzania. 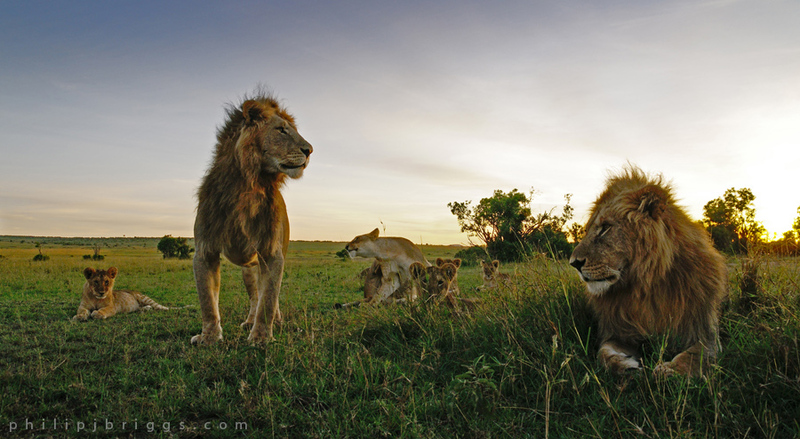 The project is aimed at protecting wild lions which live outside the security of national parks, as well as providing educational and employment opportunities for the Maasai who live in these areas alongside wildlife.